Writing an exhaustive history of internationally known Austrian musical artists is embarrasingly easy. If you narrow it down to those known outside of the German-speaking countries it is easier. If you narrow it down even more and only include people from Vienna it is even easier: There's only one left, since Salzburg has, perhaps unfairly, laid claim to Mozart[a]. 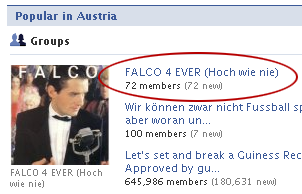 Falco took the attitude of a whole generation and brought it to the world. He was Austria's first and probably only international pop star.